The plan was to have these ready for Valentine's Day but then we don't really celebrate it, so you see the urgency wasn't there. Understand, I love my husband dearly and like him almost every day of the week but we just don't do the whole gift giving, ceremonious proclamation of love on one specific day, every year. I much prefer that that to happen, on say a Tuesday, when it's been a rough day at school, the house looks like a dump, there's nothing on for dinner, my Masters isn't writing itself and he brings me tea and biscuits in my favourite mug. Now that ladies and gentlemen, is way better than anything I might get on Valentines Day. It's the simple things right? But then I had started making these and.. just kinda left them be. 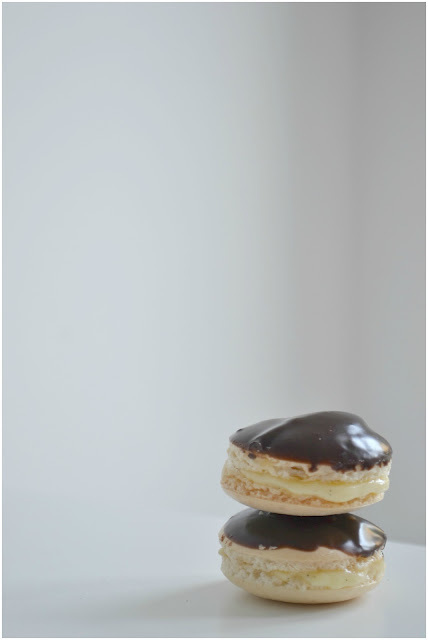 So I put them together this morning and went with something for Macaron Monday instead. Husband still got his sweets, they happened to be for after breakfast instead. EEeeehhhh responsibility me should say... I don't necessarily recommend these as a breakfast, they are very heavy and very sweet but really, who am I to dictate your mornings choices? You follow that sugar laden yellow brick road if you want to. I'm just saying, some bran flakes might see you straight first! 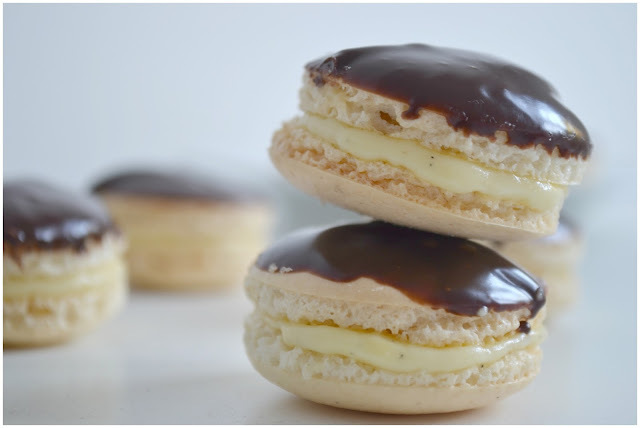 BEFORE try to make these, make sure you have allotted yourself some time. For the cream pie filling I would recommend starting it the day before and just have it waiting for you in the fridge. The macaron take as much time as they need, they can't really be rushed. But giving yourself time here will ensure success, plus you can avoid doing anything in your real life because you're baking, and you have to concentrate. Scrape the seeds out of the vanilla pod and put the pod, plus the seeds in a pot. Add 50g of sugar and milk and gently heat over a low-medium heat. but do not allow it to boil. In a separate bowl whisk together the rest of the sugar, the eggs and the corn flour. When the milk is hot, but not boiling, remove it from the heat and pour 3/4 of it into the egg mix. Whisk it all together and transfer it back into the pot and back onto the heat. Allow the custard to cook, to become thick and bubbling for about 1 minute. Remove from the heat and push through a sieve to remove any lumps, into a clean bowl. Stir in the butter and allow to cool before popping in the fridge for at least four hours, or even better over night. On a high speed, whip your egg whites until soft peaks form. Add the vanilla. Continue whipping the egg whites on a high speed and start pouring the caster sugar into the mixing bowl. I start off with a slow and steady stream and stop after 1/3 has gone in. I let it whip for a while and start again, adding another 1/3 and then stopping pouring sugar. Repeat for the third batch. I use a silicone macaron mat to pipe my shells to size. You can print off macaron templates which are very helpful in giving you a good reference for size. Line a few baking trays with parchment, and using your template, pipe circles onto the tray. Preheat your oven to 130C/260F or gas mark 2. Once the macarons are ready for the oven, pop them in for 8 minutes. After the 8 minutes, insert a wooden spoon into the oven door to keep it a little bit open. Continue baking for another 4-6 minutes until the top of the shell is crisp and if you wiggled it, gently, from side to side it should be one piece! Put the heavy cream and the chocolate in a bowl and pop it in the microwave. 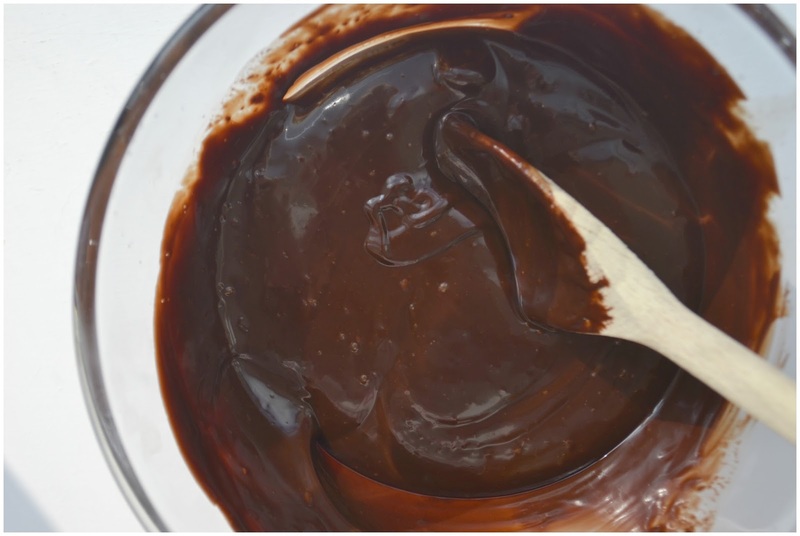 You want to heat the cream enough so it will melt the chocolate, but not too hot that it boils in the bowl. I use a medium setting for a minute, then check and stir. Then pop it back in for another minute and stir again until it's completely melted and mixed together. Set it to one side to cool. It will thicken as it cools. 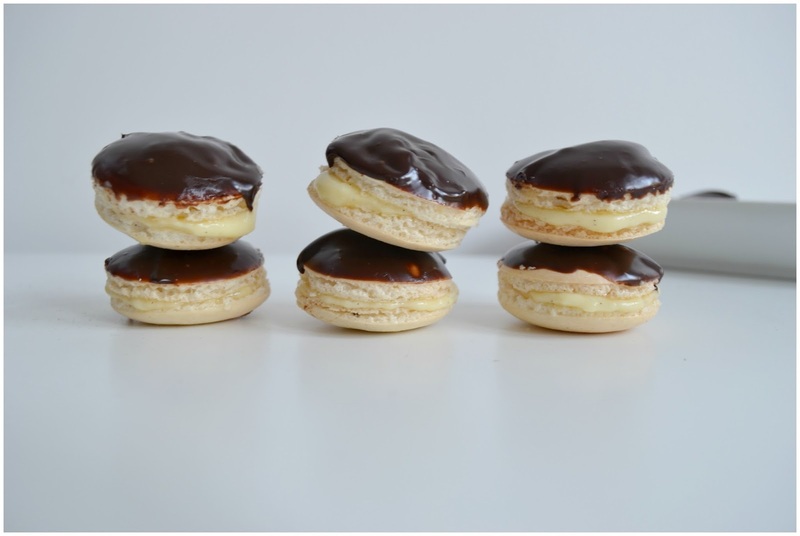 Match your macarons together so that they are in equal enough sized pairs. 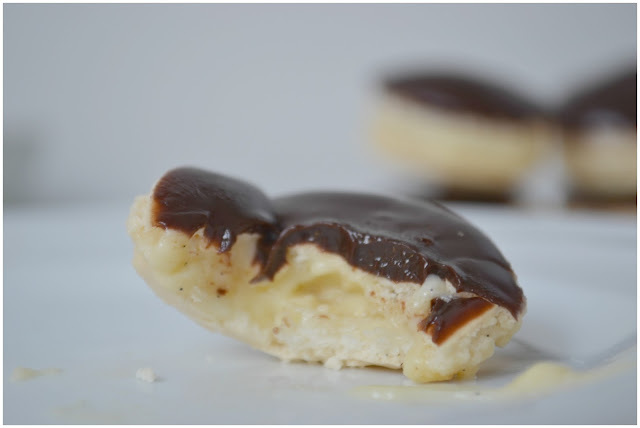 Using the top shell, gently dip it into the chocolate coating until it is evenly covered. Be very gentle and only apply a thin coat on the top. Pop into the fridge to firm up. On the other half of the shell, pipe or spoon out as much filling as you like and once the chocolate coat on the other half of the shell has firmed pop it on. These are messy as all hell... So I advise storing them in the fridge until you are about to serve/eat them. These do sound very good, but I just know I can't be bothered to do something a day in advance and wait all that time! We don't really do Valentines but I had some left over cookies from a baking order so my husband got those from me... And he vacuumed the entire house, which is a pretty good Valentine's gift in my eyes! Oh gosh I think I could eat that cream pie filling by itself - it sounds so good! 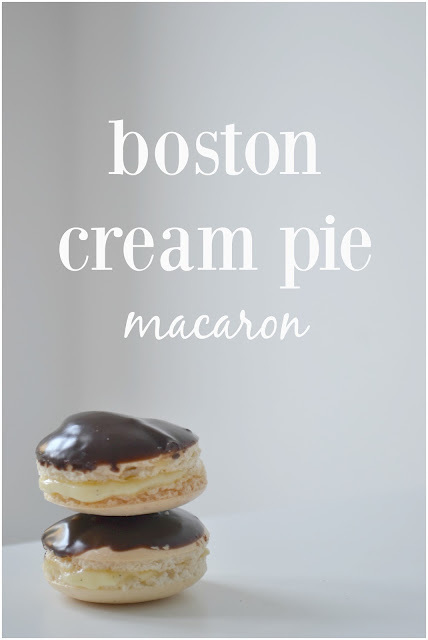 I've never been brave enough to make macarons and don't think I'll attempt it but I love seeing yours all the same! Ha! Thanks Sarah, the filling is so delicious and really yummy with vanilla bean cake. 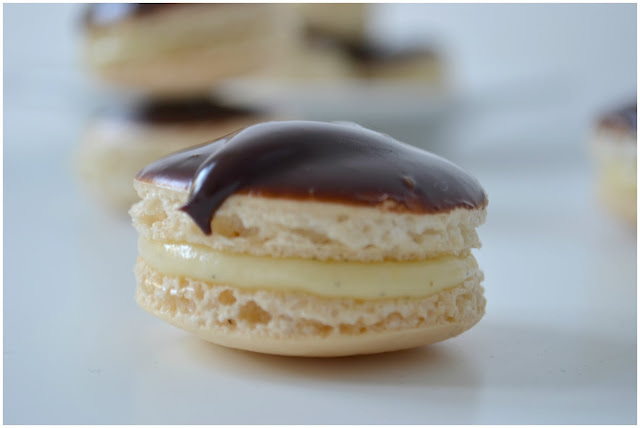 Definitely give that part a try, even if you never attempt the macarons! I was going to write "I'd love to crawl into your brain where you conjure up all these awesome ideas for baked treats" but actually I'd rather crawl into your kitchen to eat your baked treats. Reading both of these statements back, I sound like a proper creep. I should just leave it at "WOW, those look sooooo good!" I like how making a custard filling solves the left over egg yolk problem with making macarons. Win win situation! Jo, you know what even if all you said was those two creeper statements, I would get it! And be totally ok with it!! 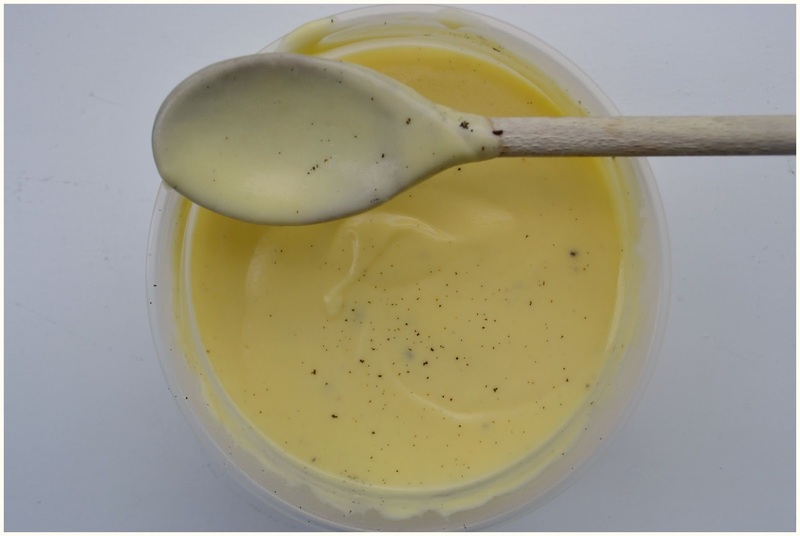 The custard is a great way to use up egg yolks so keep it in your back pocket for any time you only need egg whites! These look delicious Hazel, and really, not too too big for a breakfast treat? It's nice to hear that both of you do little things for each other throughout your ordinary days. My husband HATES all commercial holidays, so nothing comes my way. But I do give him a card and a small amount of dark chocolate (which he loves), but we don't decorate or go overboard. I wish he was a little more for the everyday "gifts" of love, but it seems he is losing that romantic trait he had when he was young. Ah well, what can you do.